The pending zoning issue affects land behind this barricade at the end of Pleasant Way. 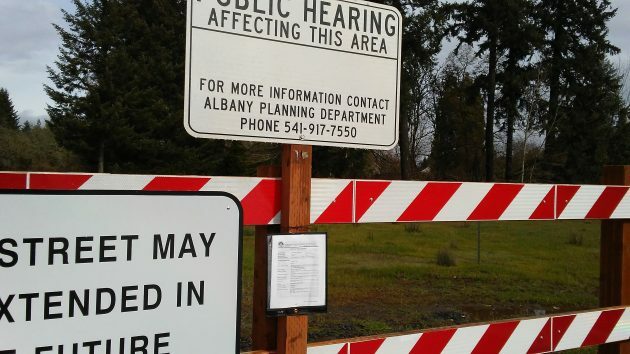 Last week’s Albany Planning Commission hearing on a North Albany zone change ended without resolution because the commission voted to keep the record open for additional testimony. So what happens next? The 12.7-acre property at issue is north of Hickory Street at the end of Pleasant Way. It is zoned medium-density residential, which allows apartments up to 45 feet tall. Developer Jim Winkler of Portland is asking for a change to mixed-use commercial, which would allow a building height up to 50 feet. He says he’d like to develop family and senior housing less dependent on cars. And he has agreed to deed restrictions that would limit additional traffic to no more than the 192 peak-hour trips that would be added if the land was developed to its maximum density under existing zoning. More than a dozen people had concerns or objected to the zone change at a hearing March 6. The commission postponed action, though, to allow more testimony, plus rebuttal testimony, and responses to any rebuttals — all in written form. To allow for all that to play out, the planning commission will meet again on Monday, April 3, to deliberate and reach a decision. If the commission denies the change, that will be it unless the applicant appeals to the city council. If the commission votes in favor of the change, it will be in the form of a recommendation to the council. In that case, the council will hold a new public hearing. City Planner David Martineau told me the council hearing will be no sooner than April 26 and maybe later. Nearby residents don’t know what’s proposed to be built there, and some are worried about the impact. A letter to the council from John and Lonna Hughes, who live nearby on Picardy Lane, may be typical. They are concerned whether construction will affect the flood zone. They also worry about added traffic on Pleasant Way, Hickory Street, North Albany Road and Spring Hill Drive, as well as through the North Pointe neighborhood. They wonder if nearby schools have the capacity to add students. I can’t say what the impact would be on the other items listed, but I’m pretty sure the five deer seen grazing in the area will do the same thing whether the building is 45 or 50′ tall. They will join the five deer that are regularly grazing in my front yard. I’m sure there will be plenty of fruit to go around in the fall and the detente with my Labrador will continue, regardless of the herd size. Unfortunately at the hearing that was held the builder was quite vague. He would not commit to anything that he planned to build because I believe he wants to be able to re-zone this for his own interest and wealth. What people do understand is that he plans to build high-rise apartments 50 feet high, high density , low income apartments. He also thought that he might incorporate like a barbershop or some other type of shopping, when in fact we have multiple empty storefronts in the old Rays shopping center. We have serious traffic issues in North Albany and adding this many more apartments will not be suitable to the environment here. During peak traffic hours if you are on Hickory Street trying to get onto Spring Hill you may set there for 10 minutes or more trying to get onto Spring Hill. We also have problems with not enough schools. When the builder was addressed with his low income housing proposal, he made a comment ” We didn’t I’ll start out millionaires ” well neither did most of the rest of us in our North Albany homes. We have all worked very hard to get to where we are. The other great concern is the crime rate that will occur with this type of housing in the community. We also have the flood plane to consider and where the drainage and run off will go when this type of building occurs. All in all this is a very bad decision for the North Albany.